Arnott Air Suspension Products has introduced aftermarket replacement air suspension struts for the 2010-2012 Land Rover Range Rover® (L322 Chassis) with continuous variable adaptive damping suspension (VDS). The Arnott-designed front struts AS-2797 (right) and AS-2798 (left) for HSE and Supercharged Range Rover models with continuous VDS are brand-new and not remanufactured. Arnott's exclusive design features a new custom-made and tuned monotube shock absorber valved to ride like the O.E. Completely assembled in the U.S., the strut features tier-one components including a multi-ply air bladder, heavy-duty crimping rings and air fitting as well as new seals and a rugged stamped steel top. 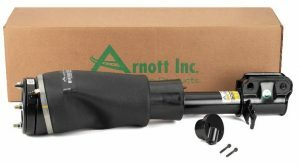 This Arnott-designed new Range Rover strut requires no core deposit or handling and is backed by Arnott’s renowned limited lifetime warranty in North America. Arnott offers an extensive selection of high quality remanufactured OE and aftermarket new replacement products for the Land Rover Discovery (LR3, LR4 and Series II), Range Rover L322, L405 and P38A and Range Rover Sport including L320 and L494. Click to learn more about Arnott replacement air suspension products for Land Rover.